What food represents the American pub food experience better than the cheeseburger? A staggering 103 million of these classic sandwiches are eaten on average every day in this country. The cheeseburger appears on clothing, toys, refrigerator magnets, and even has songs written about it. But what are the origins of this nationally revered food item? As one might guess, hamburgers (sans cheese) get their name from Hamburg, Germany, where the first in-print mention of a “Hamburg steak” was made in 1884. The term stuck, and it wasn’t long before references to a “hamburger sandwich” were being made in the Chicago Tribune. What really established the hamburger as a ground beef patty between two pieces of bread, though, was the 1904 St. Louis World’s Fair. There, the hamburger gained popularity as multiple vendors sold them to a wide audience. It wasn’t long after the World Fair that “hamburger” became a household name. Interestingly, it wasn’t until the late 1920s that the cheeseburger made an appearance. Somehow, it took two decades for people to realize the deliciousness that could be attained by simply adding a slice of cheese to a hamburger. There are multiple invention claims to both the hamburger and the cheeseburger, and they seem to have been created independently in several different times and places. Rather than trying to sort out who was the first through endless hairsplitting, it may be easier to imagine that this delicacy simply emerged from the collective American consciousness. 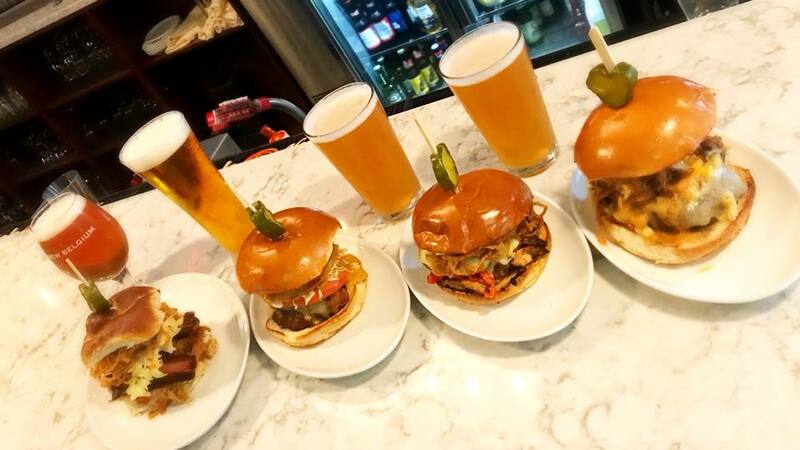 Today, there are many variations on the cheeseburger, served up as pub food in places like Murphy’s Taproom of Manchester, whose menu boasts no less than eleven different burgers! Stop by to try one out, and see how far the cheeseburger has come!